The two countries of North America—Canada and the United States—are two of the GCI’s top performers. Both countries consistently rank high on most pillars of the Index (Figure 7). However, in order to remain in the top of the rankings, both countries face important challenges, including securing the free flow of goods, people, capital, and services within the North America Free Trade Agreement with Mexico; investing in human capital, both health and education; and consolidating the basic requirements of competitiveness that lag relative to other advanced economies while at the same time protecting their advantage in innovation and business sophistication and the efficiency of their markets. Although technological progress and innovation place North America at the top of the competitiveness rankings and serve as an engine of not only local, but also global growth, the region also faces the challenges of increasing industry concentration, inequality, and sustainability. The issue of the quality of growth, not only its quantity, is particularly important in countries such as the United States. If these issues are not addressed, the institutional underpinnings of the system, as well as the performance of the region on pillars of competitiveness related to competition, human capital, and the efficient use of talent, could affect future growth and undermine growth prospects. It is no time for complacency. Achieving a competitiveness agenda that can lay the foundation for future inclusive and sustainable growth should be at the top of the agenda—even for leading countries. The United States ranks 2nd overall this year, displaying a constant improvement in score since 2010. Although ranking high overall, the country ranks 25th in basic requirements, with institutions, coming in below the top 10 and the macroeconomic environment placing 83rd. The macroeconomic environment pillar, out of all the components of the basic requirements subindex, has advanced the least and is one of the country’s worst-ranked areas. Compared with other top-ranked countries, the United States performs poorly in health and primary education, coming in 29th despite an improvement of 0.15 in score over the last year. The strength of the United States comes from its performance in efficiency enhancers and innovation and sophistication factors, where it comes in at 1st and 2nd respectively. These two subindexes reflect sound and well-functioning factors of production and product markets and a vibrant innovation ecosystem. The United States faces numerous policy uncertainties moving forward, many of which are in the areas where it is relatively weakest. Successfully meeting institutional challenges relating to both public and private institutions, improving the macroeconomic environment, and investing in human capital—particularly in the areas of health and primary education—will be crucial for the United States to maintain its position near the top of the competitiveness rankings. Canada ranks 14th this year, a very slight improvement over last year’s ranking. The main changes with respect to last year are in the efficiency of government spending (where it falls 13 places) and the macroeconomic environment (where it falls six spots), reflecting the negative international shocks via terms-of-trade deterioration and their impact on government revenues and national savings. Uncertainties regarding the United States’ trade policy present challenges to Canada, with trade disruptions potentially affecting regional value chains. 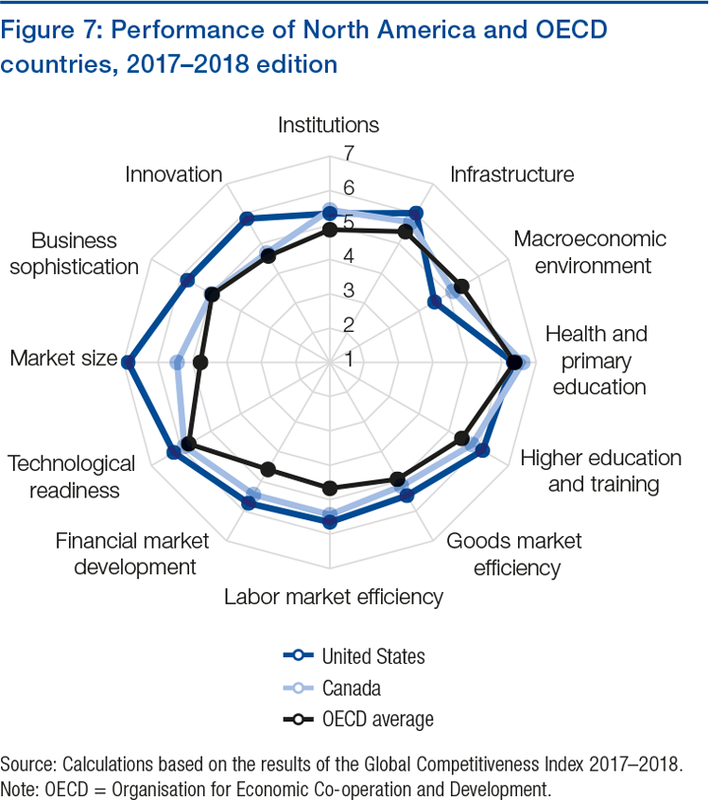 Canada’s main challenges to continue making progress toward the top 10 lie in the macroeconomic environment pillar, ranking 47th; the quantity of education subpillar, where it ranks 28th; and the technological readiness, business sophistication, and innovation pillars where it ranks in the 20s. On the other hand, Canada ranks a high 7th in labor market efficiency, driven mainly by the efficient use of talent (3rd).